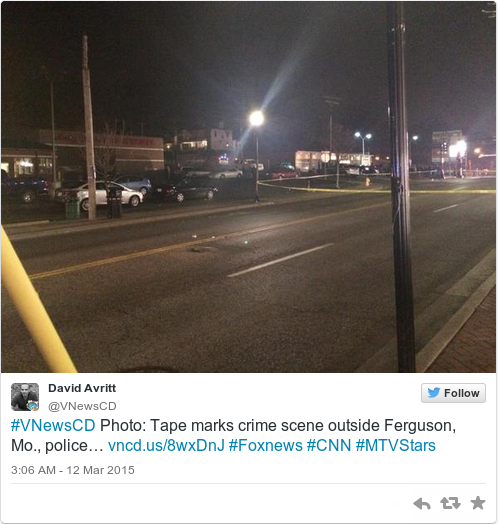 TWO OFFICERS HAVE been shot during protests near the police department in Ferguson. Following this tweet, it said that one St Louis County PD officer and one Webster Grovers officer were shot. A video has emerged that purportedly shows the moment the shooting took place. While the footage isn’t clear, the audio on this video may be disturbing to listen to. AFP reports that the St Louis Post, a local newspaper in the area, said witnesses reported hearing two to four shots, and that police had been confronting protesters at the time. AP reports that St Louis County Police Chief Jon Belmar said one officer was shot in the face, and another shot in the shoulder. The shooting came hours after the Ferguson police chief, Thomas Jackson, resigned. This itself came a week after a US Justice Department report into the fatal shooting of unarmed black teenager Michael Brown by one of Jackson’s officers. Brown was shot seven months ago by white police officer Darren Wilson. The shooting ignited fierce protests not just in the town, but across America. In a brief statement, the City of Ferguson confirmed it had agreed “a mutual separation” with Jackson that would see him get severance pay and health insurance for a year. The Justice Department said last Wednesday said it lacked sufficient evidence to prosecute Wilson on federal civil rights charges over the death of Brown. But it faulted Ferguson’s city hall, police department and municipal court for racial bias in targeting its African-American majority as a means to generate revenue. Brown’s family has indicated it intends to file a civil lawsuit against Ferguson and Wilson. Jackson was the fifth Ferguson official to resign in the wake of the Justice Department’s findings. A grand jury in November chose not to indict Wilson on murder or manslaughter charges, which reigniting protests in Ferguson. Email “Two officers shot near Ferguson police department ”. Feedback on “Two officers shot near Ferguson police department ”.